fun, accessible, and delivers VOI? The Fitstyle by Shana™Work Well Program uses the "Fitstyle Your Life" approach to fitness - helping you find time for fitness where you didn’t think it existed and incorporating exercise in ways that helps your team stay engaged and productive. This unique program has three components that focus on community, culture and the individual. Fitstyle Walking Tours: Take an exercise break and explore your neighborhood. Led by certified group fitness instructors, these brisk walks that start and end from your office help your staff rack up those steps and get to know their community. 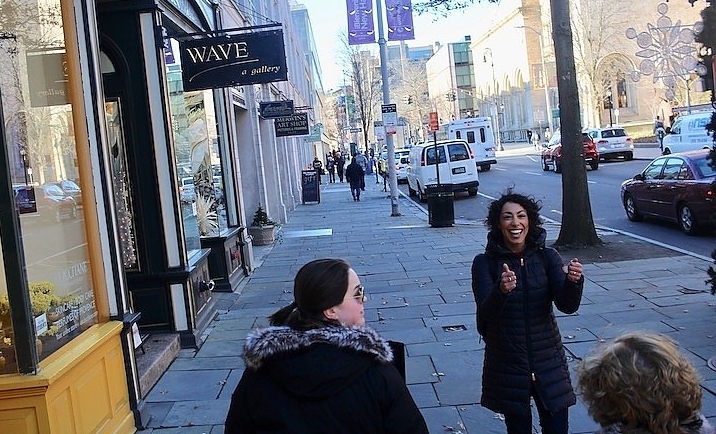 The Fitstyle Walking Tour Guides share history and interesting facts about the surrounding area, while setting a brisk pace and offering fitness tips along the way. Your staff will get the health benefits along with enjoying the camaraderie that comes with spending time together. Fitstyle Workshops: Do you spend hours sitting at a desk or feel like you have to choose between work or a workout? These interactive workshops show you how to find time for fitness at home and in the workplace, helping you create a culture of fitness. Shana Schneider, Founder of Fitstyle by Shana, leads you in easy exercises and stretches and helps you gain a new perspective on fitness. You'll walk away with new ideas for how to make fitness part of your office culture and your own personal lifestyle. Perfect for a lunchtime event or as part of a staff meeting. Each workshop can be custom tailored to suit your team's needs and no fitness clothes required. Fitstyle Texting: Have you wondered how to turn good posture or drinking water into part of your lifestyle? Based on research for creating habits and changing behavior as an adult, this proprietary series of text messages encourages movement throughout the day and motivates you to keep reaching for those fitness goals. Plus, the one-on-one engagement through text messaging offers a personalized experience for staff members. and answer any questions you may have about the Work Well Program. Fill out the quick form below and I'll get back to you! How did you hear about Fitsyle?